I moved to the San Diego from Australia in August 2015, and Paul asked me if I could write something on my first impressions of doing science in the US, as opposed to other countries I have worked/studied in (Australia, Scotland, Sweden and Singapore). 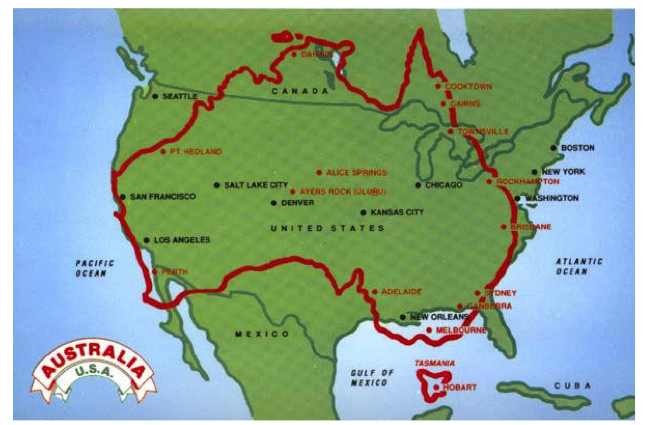 If you look at the land size of Australia and consider that we have only 7% of the US population you will understand directly that funding and collaborative opportunities are not as easy to find. There’s probably little collaborative advantage in the US compared to Europe, which has over double the number of people as the US and only 3% larger land mass. In defense of Australia we punch above our weight, with the first stem cell company (Stem Cell Sciences) and currently the world’s largest (Mesoblast) originating there…even Viacyte has Australian origins. It seems like it is hard not to be political here in the US….I guess I have arrived at a special time, but after working in Sweden for 5 years and living through gun control regulation following the 1996 Port Arthur massacre in Australia, I don’t understand the opposition to publicly funded healthcare, how a regarded education is ‘purchased’ and the 17th century resistance to gun control regulation. …I guess you need to be born into it. I think the political minorities have almost as much backing in Australia but are not as extreme and have less volume, so the international effects are minimised. Relevant to stem cell research, the Colorado Springs Planned Parenthood shooting in November 2015, made me wonder how extreme the fight to protect the rights of a fertilised egg still is. My only explanation for these people is a 16th century belief in a ‘homunculus’ (fully formed miniature human present in every sperm)…Someone please get them a microscope. – 2014 Obama allocation of $166 million, while non-embryonic only slightly increased ($443 million), with a large allocation to iPSC projects. This even indicates the recognised importance of pluripotent technologies over adult somatic technologies. I wonder though if this balance is also recognised in the public and adult somatic cell spaces. In an effort to sell an alternative to hESC, the potential of adult somatic stem cells was drastically inflated. Recently I have attended a number of adult somatic stem cell talks who describe the expression of Oct4/nanog etc. in their population of choice, even call them pluripotent….though I am yet to see the teratoma/PluriTest, or clinical trial for functional long term grafting behaviour. Literally hundreds of clinical trials on MSCs have been done over the last 15 years so I guess if the data were there, we would have seen it. 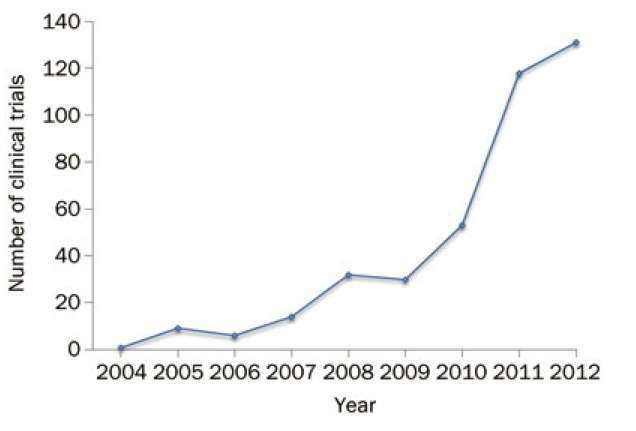 Number of registered clinical trials of mesenchymal stem cells-based therapy on ClinicalTrials.gov. My fears were allayed when reading Don Reed’s book, in which he interviews fantastic adult stem cell researcher and patient advocate, Dr Jan Nolta. When asked if injection of mesenchymal stem cells was a possible cure for Huntington’s Disease, she answered straight out “No,…..But it buys us time”. Herself and Dr Vickie Wheelock agreed that hESC or hiPSC would be needed for the actual cure. It’s refreshing to see this honesty, a recognition that we need to work together, promote both sides, but realise the timelines of expected contribution from each. Saying it is not a cure does not mean it is not important. So far I have enjoyed a range of meetings, including both Stem Cells on the Mesa and the World Stem Cell Summit on US soil and look forward to ISSCR in June. Unfortunately from Australia it is wildly expensive and time-consuming to travel to all of these meetings….you can fly LAX to Sydney in 15 hours as opposed to the 12 hours it took my husband to get from San Diego to Florida…. Good or bad I think the US is a place where anyone with a decent backing can make changes with great relevance on the International scale. If you can legalise hESC research under a Republican government, you can do anything! What countries are ‘punching above their weight’ in stem cell space? hESC Research has never been illegal to my knowledge. The issue was federal funding of embryonic stem cell research. If you must politicize, let’s not forget either that President Clinton, a Democrat, also had moral and ethical concerns. He declined to fund research on embryos created solely for research purposes. Times have changed however and now the public waits for all the magnificent cures that scientists have told us can be achieved with embryonic stem cells. How close are we to achieving that? I think you did get off in the weeds with the Planned Parenthood shooting. By all indications, the shooter is a nut job, a one off, not part of any extremist group trying to protect the rights of fertilized eggs. Planned Parenthood has been in the news for it’s callous treatment of aborted fetuses harvested for their body parts. The shooter may have been incensed by that. I don’t think anyone knows at this point. Planned Parenthood receives federal funds so it is natural that it is part of the political conversation in this country. Welcome to America! I hope your time in USA is productive and rewarding. There have been several other publications of larger data sets since then. They arrive at the same conclusion. The public at large, especially those with current diseases or injuries, are most rushing about, ignorantly pursuing fixes and cures emanating from mostly unknown and unregulated private clinics, especially in California. I am one of those potential patients. I hesitate because I have read about the scams, the lack of an FDA imprimatur, the disappointment of those whose expectations have been undermined that I have communicated with. For all the work and research, we have bloody little to help us out, even in an area like musculo-skeletal injuries, where the promise was so profound. We really have nothing that we can count on except often useless surgeries performed which correct little or nothing and often create more pain and suffering. Translating research to actual clinical benefits has been miserable overall. What we have is Prolotherapy, PRP and dubious, uncontrolled, unpredictable, hugely expensive stem-cell pseudo-treatments. Why can’t you all do better? Why can’t you find some billionaire funders (there are many out there all over the world) that you can mine? It’s certainly in their best interests. I doubt that we can attribute present-day religious opinions about embryonic stem cell research and abortion to the 16th century revival of the idea of homunculus. Even the Catholic Church didn’t take their absolutist view against abortion until 1869. Even after 1869 there was a good deal of “fuzziness” with respect to when “quickening” happened. I think you will find that at the beginning of the 19th Century there was not a single statute in the United States regarding abortion. By the beginning of the 20’th century, abortion at any time during pregnancy had been banned throughout the USA. There are a good many things that one could argue that might have caused such a major shift in attitudes and laws. The one that I give most credence to is grounded in human ecology. Commercial interests have always sought to grow population. Indeed, the conventional economic model — which is total nonsense, of course — is predicated upon growth, including population growth. Unsurprisingly, abortion became a target. The medical profession was one commercial interest that had a lot to do with changing USA attitudes in the 19th century. At the beginning of the 19th century, pretty much anyone could call themselves a medical doctor in the USA. By the mid 19th century there was a transition towards university-educated doctors. The AMA was formed to protect the interests of the new profession. Job 1 was laying claim to a monopoly on abortion! Life goes on. Stay tuned for the rest of the 21st century. you’re right barb it was illegal with federal but not private funding. In Australia you still cannot create an embryo purely for research purposes, it’s all excess IVF. Is this not the case in the U.S.? For sure PP was a nut job result of blatant lies from anti abortion groups. Thanks for the link Brian. The study seems to show the BMSC are safe but not that they turn into cartilage? Interesting timeline on abortion! Thanks 😉 my ‘homunculus’ theory is that people need more exposure to understanding embryonic development as it really seems they imagine head/arms/legs people being chopped up. Something I would be opposed to purely for research. Sorry to hear of your troubles Manny. Check out ‘humans for cures’ amazing organisation that shows just how much is being done. I think pluripotent stem cell therapies are the new ‘computer’ or ‘polio vaccination’ something that seemed impossible for the wider public but with the right advocacy and drive over decades is now firmly established. Heather, For the record, I did not say the Planned Parenthood attack was the result of blatant lies from anti abortion groups. The callous attitude towards aborted fetuses for the harvest of their body parts that was shown in videos of Planned Parenthood doctors may have incensed him. That is what I was stating. We really do not even know that at this point, but we can agree that he is a nut job. 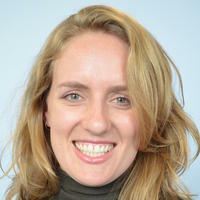 Hi Heather, I hope you are settling in well in San Diego!